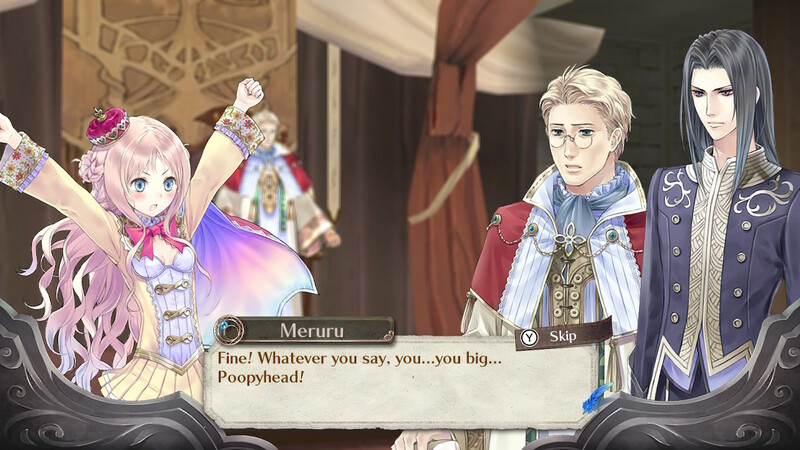 In Atelier Meruru, you take on the role of Princess Merurulince “Meruru” Rede Arls, the sole heir to the kingdom of Arls. Arls is a tiny little rural village that is set to be absorbed by the Republic of Arland in five years’ time, and its proud king Dessier wishes to grow the kingdom and its prosperity as much as possible before the merger takes place. Meruru, as a spunky fifteen-year old girl, has no real interest in her “royal duties”, but she has developed something of a fascination with the new alchemist in town — one Totooria Helmold. Dessier initially takes a rather strict approach to Meruru, forbidding her from becoming Totori’s pupil and taking up the study of alchemy. However, in collaboration with the castle’s stern but fair butler Rufus, Meruru devises a plan to make use of alchemy to fulfil her duties and help her father grow the kingdom, thereby allowing her to pursue her interests and do what she’s supposed to. Dessier is left with little choice but to agree to her suggestion — but with a caveat. Fail to grow the kingdom to a population of at least 30,000 by her 18th birthday — two years before the merger with Arland — and she will have to give up alchemy for good. 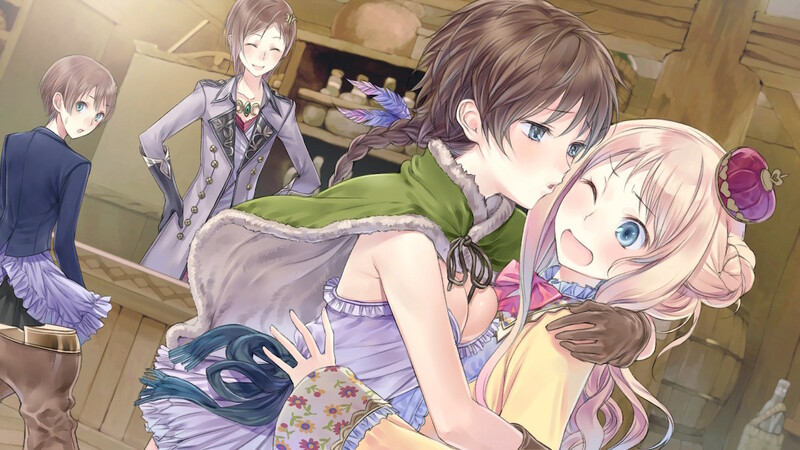 Structurally, what this narrative setup means for Atelier Meruru is that it occupies a bit of a middle ground between how Atelier Totori and Atelier Rorona did things. You have a long-term goal as in Atelier Totori, but achieving this is dependent on accomplishing a number of smaller tasks, as in Atelier Rorona. The difference here is that there are no hard deadlines aside from the final one, so while you’ll still need to manage your time effectively if you want to meet the main goal and continue onwards to the various “true” endings of the game, you have a lot of freedom as to what tasks you might want to prioritise — or whether you want to spend some time taking care of Meruru and her party members instead. Initially, Meruru is given some simple tasks by Rufus, but as the game proceeds she starts to receive letters from people who live in the kingdom. 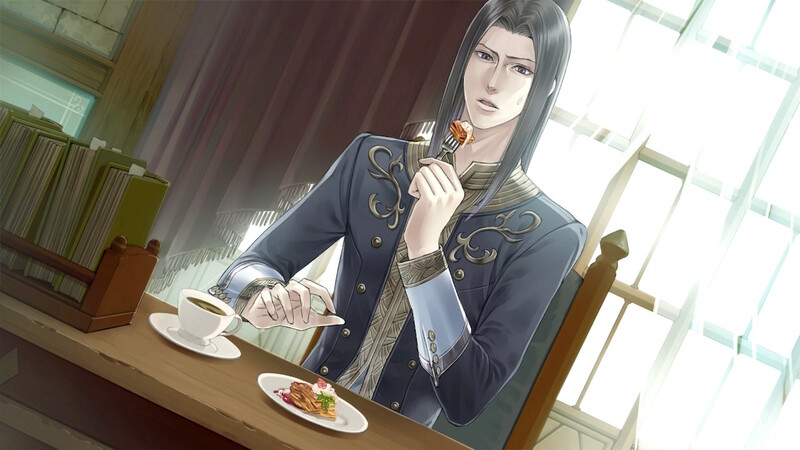 These requests are often vaguely worded, so they must be taken to Rufus for him to devise a specific series of tasks for Meruru to accomplish. Tasks fall into a number of different categories according to the development activity they’re attached to. For starters, for the kingdom to expand its borders and transportation network, Meruru will need to visit areas at the current ends of various roads and clear out all the monsters therein; after this, workers will come along and build a road to the next area. Eventually, the road will reach one of the game’s more major areas, at which point Meruru will have the opportunity to work on an episodic series of tasks to develop the area through several stages. This is where Atelier Meruru really shines by letting you feel like you’re having a real impact on the game world. Accomplishing a complete “set” of all these major tasks has a noticeable influence on the area — the first stage of development (which is usually the most significant, taking a region from untamed wilderness to vaguely civilised) generally takes a couple of in-game weeks for an effect to be visible, but later in the game the things you do have an immediate effect that you can see right away, and likely benefit you as well as the people of Arls. A good example in the relatively early game comes in the form of an empty mine Meruru stumbles across in her travels. This has been long abandoned, and in the meantime, ghosts have taken up residence — so for development to continue, Meruru must clear out enough ghosts for workers to be able to come in safely, make tools for them, figure out a way to keep the ghosts away permanently and produce some explosives to blast into some of the richer veins of ore and gems. With every step of the process, Meruru is able to proceed further into the mine, and the quality of the materials she is able to gather there increases. 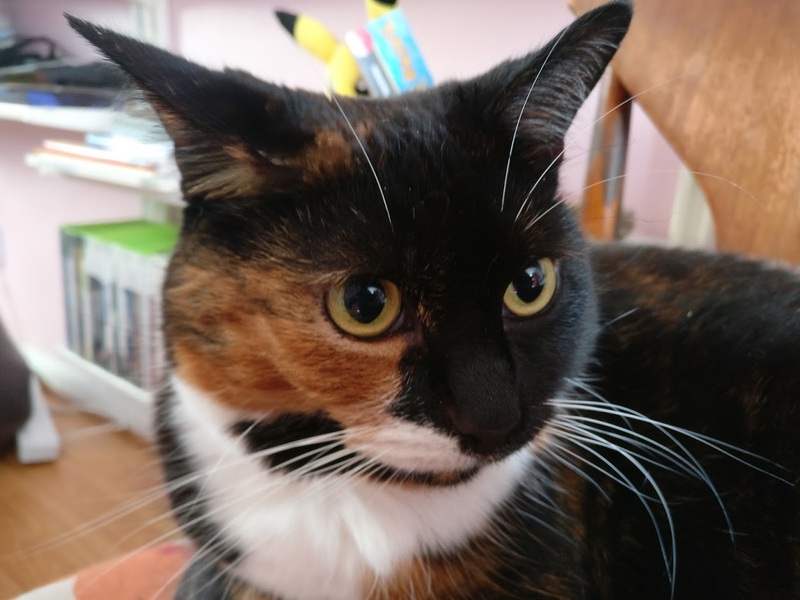 Every development task Meruru successfully performs rewards her with Development Points. These have a couple of purposes: firstly, their cumulative total counts towards the kingdom’s overall “rank”, with big boosts in population, new alchemy recipes and additional benefits becoming available at each new rank. And secondly, they can be spent to construct various facilities in Arls, each of which provides ongoing passive benefits to Meruru (such as experience boosts for alchemy and adventuring) as well as increasing the population further. One additional factor to juggle is Meruru’s popularity level. This declines slightly every day, and if it ever reaches zero, results in an immediate game over. However, it can be increased by completing Adventurer’s Guild quests, distributed at the tavern by Esty’s sister Filly. Unlike both Rorona and Totori, quests have no time limit, so you can complete them at your leisure; they’re also seemingly set up in such a way that you will get requests to collect items that you will likely be gathering anyway at the point you’re at in the game, meaning you’ll rarely need to go out of your way. Popularity is important for another reason, too: the higher it is, the faster the population grows over time. As well as the large injections of population from ranking up the kingdom and constructing the facilities, the population grows a little every day, following something of an exponential curve — in other words, the larger the total population, the more it will increase every day. Meruru’s popularity value effectively works as something of a “multiplier” to this base growth value, so it is helpful to keep it topped up as much as possible — and indeed many of the facilities you build help to accelerate the rate at which you gain popularity while reducing the rate at which it declines. So that’s the overall structure of how the game works: complete tasks to make overall progression and unlock new areas, complete quests to earn money and keep the game going, then spend the rest of your time gathering items and gaining experience in both adventuring and alchemy. 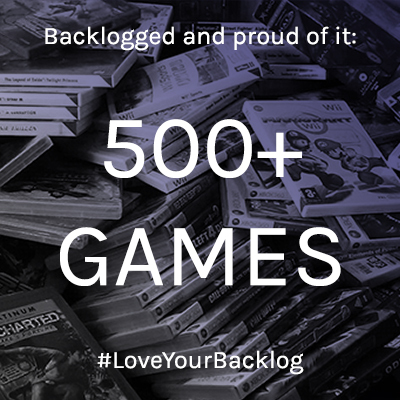 Repeat until you meet the 30,000 population goal at the end of the third year — or not, for what is technically the “bad” ending, but still counted as a game clear rather than a game over regardless, allowing you to carry certain items through to another playthrough. Assuming you are successful, you then proceed for another two years until you accomplish one of ten “main” endings… or fail to accomplish any of those (worryingly easier than you might think, particularly on your first playthrough) for another shot at the “bad” ending. Then play the whole thing again for a different ending. 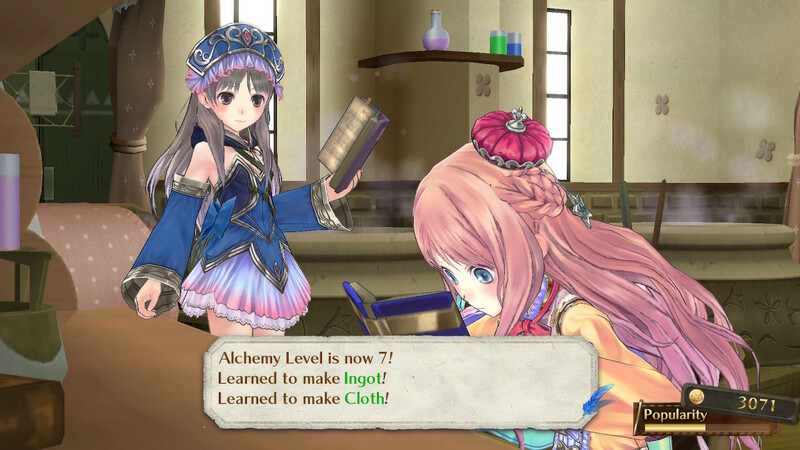 Much like its two predecessors, Atelier Meruru can be clearly divided into a number of distinct components: alchemy, exploration and gathering, combat and events. Balancing all of these is essential to success in the game, but they all take up varying amounts of time. 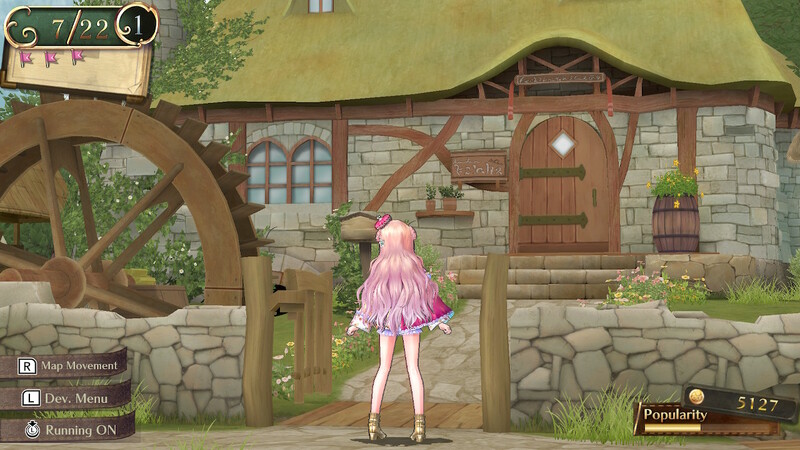 Those who played Atelier Rorona Plus will be immediately at home with Atelier Meruru’s alchemy system, since it was Meruru’s core mechanics that were ported back to Rorona Plus as one of its most significant enhancements outside its graphical improvements. Once again, recipes are made of one or more ingredients, which can either be a broad type of ingredient or a specific item. Different types of item and varying quality levels can cause usable items to have different effects, and up to five traits can be passed down from component ingredients to final product, within an overall “cost” limit. Atelier Meruru’s main addition to this system over Totori is the ability to combine different levels of the same Trait together to create a third trait with considerably enhanced effectiveness. For example, creating a final item with both “Quality lv. 1” and “Quality lv. 2” attached to it allows you to use the “Hand-Crafted” trait; this costs a lot more than using the two “Quality” traits separately, but has a much more significant boost to the final quality level of the item. Any traits with an explicit “level” to them can be combined in this way for a variety of different effects. 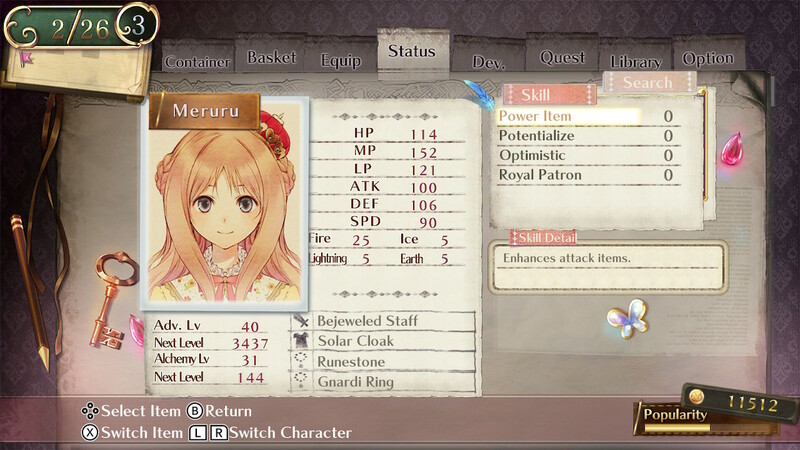 Traits are very important in Atelier Meruru, since many of the development tasks allow you to submit fewer items if you produce items of a particular quality level or with a specific trait attached. A lot of the time, this is a matter of just submitting maybe two or three items instead of five or six, but there are a couple of instances where attaching the correct trait allows you to submit five instead of 50 — much easier on the wallet, your gathered ingredients and that ever-ticking time limit! Because of Atelier Meruru’s focus on developing the kingdom, there are a lot more items that only really have a single use in the game and give you no benefit if you make more than you need. These are helpfully separated into their own “Development” category and include both items you need to submit for development tasks such as tools, and equippable “search items” that allow Meruru to do her job more effectively. These latter types of item perform much the same functions as the workshop decorations in Atelier Rorona Plus; thankfully, unlike Atelier Totori, where such items simply had to be carried in the heroine’s basket and thus did not carry over into a New Game Plus, any equipped search items Meruru has at the end of a playthrough are saved as part of your clear data along with your equipped weapons, armour, accessories and money. Since they all take a not-insignificant amount of time to make (not to mention tracking down some of the rarer ingredients! ), being able to carry these over is a big timesaver for subsequent attempts. As in previous games, weapons and armour are handled by local blacksmith Hagel — metal ingots result in weapons, while pieces of cloth result in armour. While weapons have a strict vertical progression as in previous games, each “tier” of cloth generally provides access to several different types of armour for various recruitable characters, with some emphasising defense while others provide a more balanced boost to the character’s overall stats. On top of equippable items’ base performance, you can also, of course, add traits to your materials, and doing so allows you to create very effective equipment, which is essential if you want to meet some of the tougher ending requirements in the two-year “extension” period. Accessories, meanwhile, are produced by Meruru herself, and are quite fiddly to make in many cases. There’s a broad range of possible effects, however, including a couple where you specifically have to pick your ingredients carefully to avoid negative side-effects! For example, one ring that allows you to regenerate HP and MP induces “muscle atrophy” (a reduction to overall attack and defense levels) if you don’t use appropriate materials; another is simply designed to swap a character’s HP and MP maximums, so you’ll need to think very carefully before making use of this! 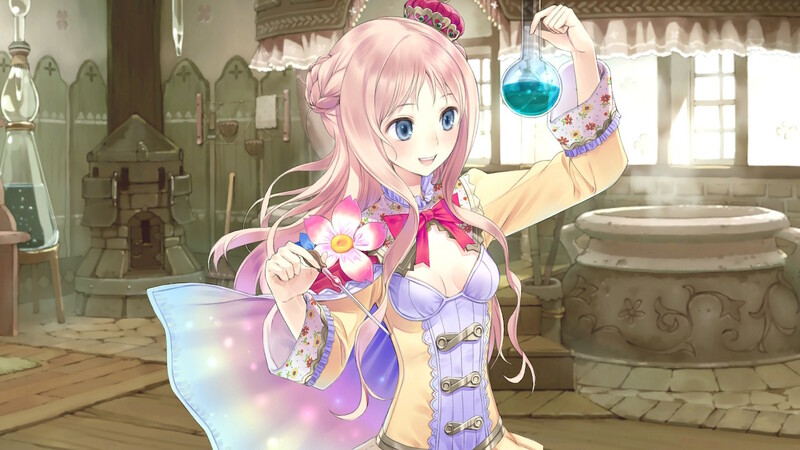 As in the previous two games, Meruru has a bit of help in the workshop after a while — this time in the form of both incarnations of Hom from Atelier Rorona. Each Hom can be given independent orders to either gather materials from a specific area Meruru has previously visited, or to craft a specific item Meruru has previously successfully synthesised. There is an important limitation in this latter option, however; neither of the Homs are able to create any of the items in the Development or Equipment category, meaning they won’t create complex materials, task-critical items or accessories for you. They will, however, happily churn out metal ingots and cloth over time, making it straightforward enough to get all the playable characters equipped to a suitable level at any given time, and they are especially useful for mass-producing consumable items for Meruru to use in battle. 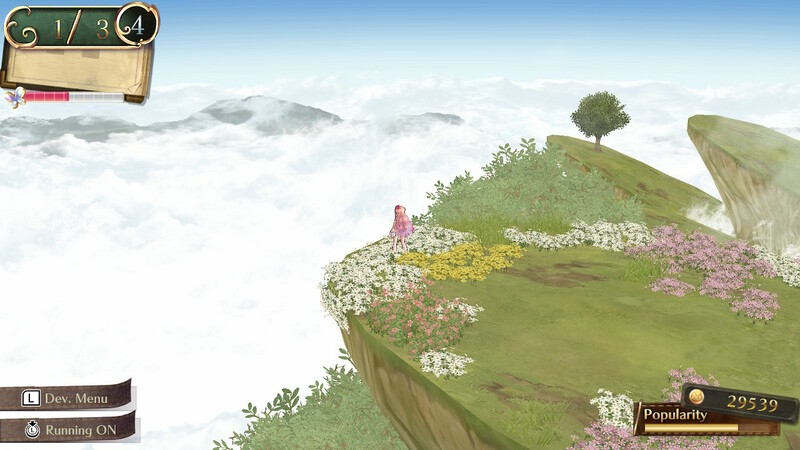 Upon leaving town, Meruru finds herself on a node-based map similar to that found in Atelier Totori, but without the random combat encounters. 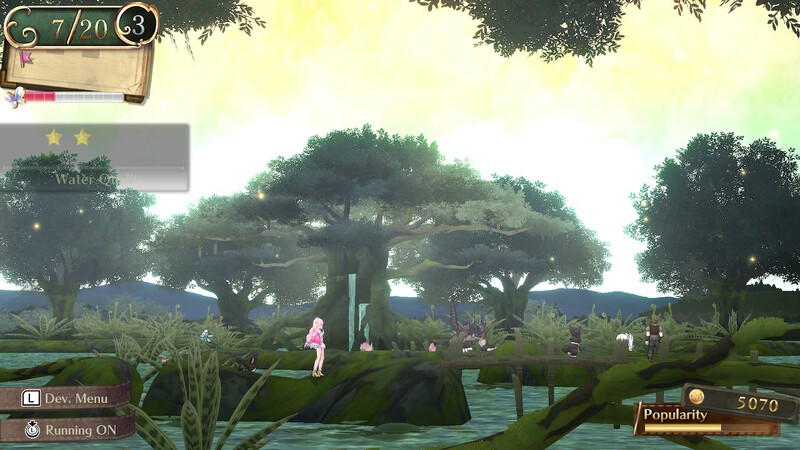 Travelling from one node to another takes at least one day, and as Meruru progresses through her development tasks more areas will become available. One interesting thing about navigation on the world map is that the initial ways you get to various major destinations take very roundabout routes, costing you a lot of time whenever you want to pay them a visit; it tends not to be until a little later that you can construct “shortcut” roads for a more direct route. As such, you’ll need to bear travel time into account when planning your next move. The world map provides plenty of helpful information. Arls, which is situated roughly in the middle of the overall map, visually changes as you construct new facilities, allowing you an easy way to see how “well” you’re doing, and hovering the cursor over each node tells you the materials you can find in that area, the monsters you can find and any development tasks outstanding in that area. Areas that are expecting item deliveries from you are highlighted with a special marker, allowing you to see at a glance how far away they are, and you can either plot a route yourself, node by node, or make use of a free cursor to allow the game to plot the shortest possible route for you. Once you reach a node, you can enter it to explore it, gather its resources and fight its monsters. Here, things proceed much as in Atelier Totori, including the timer bar that depletes by a certain amount any time you gather an item or get into combat, with a day passing any time it empties. An important difference here, however, is that just looking at a gathering point doesn’t take any time, unlike in Totori — if you decide you don’t need any of the items that particular point offers, you can leave it alone for no penalty, which is a small but welcome improvement to this system. Combat can be initiated by walking into a monster (in which case initiative is determined randomly) or by causing Meruru to strike an enemy with her staff (in which case Meruru gets to go first). 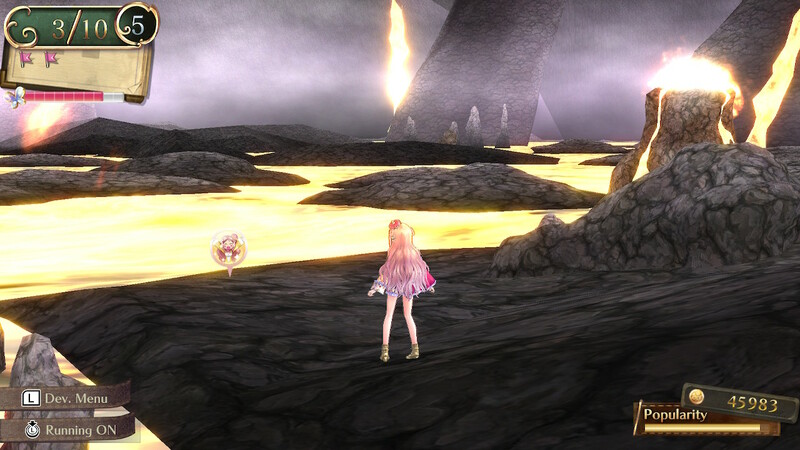 Later in the game, accomplishing a specific development task allows Meruru to unlock the ability to defeat weaker enemies on the field screen without actually fighting them; if you do this, you get all their drops and are credited for “defeating” them for the purposes of tasks that require you to obliterate all monsters from the map, but you get none of the experience. Upon unlocking this ability, if you still want to actually fight the enemies for the experience they offer (which can still be significant, even if they’re lower level than you) you can simply walk into them; under these circumstances, Meruru will always get the first turn. Once in combat, battle unfolds in a turn-based fashion, making use of a “wait time” system for various moves. In other words, different abilities will cause a character’s (or enemy’s) next turn to be earlier or later, and certain abilities are also able to manipulate the turn order to a certain degree. Combat continues until all the enemies are defeated, until you successfully run away, or until the party is defeated. 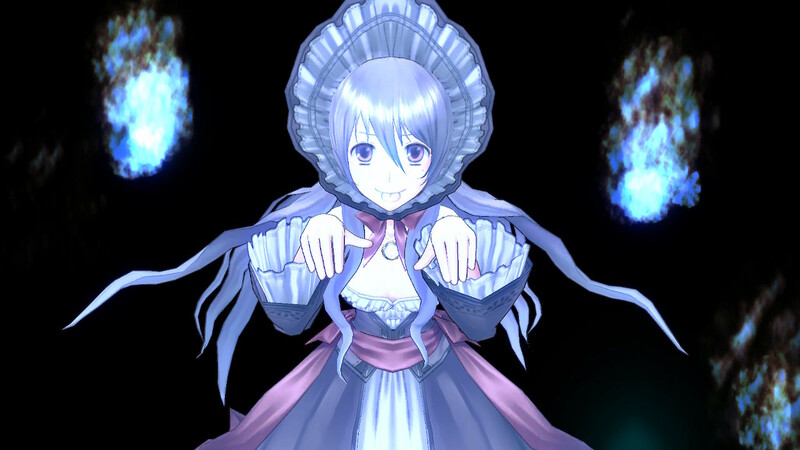 The latter case, as in the previous two games, does not result in a game over; instead, Meruru is sent back to Arls with her tail between her legs at the cost of a not-inconsiderable amount of time, though this penalty can be completely negated by successfully synthesising the “Flying Carpet” search item, which instead just sends your party back to the entrance of the area you are in with 1HP apiece. In battle, Meruru is distinct from her two predecessors in that she has no explicit active abilities of her own, and thus is fairly dependent on consumable items — though she is somewhat less of a weed in terms of physical damage output that Totori is at the outset of her own game. As such, the Assist system places a strong focus on item use, ultimately allowing for some quite lengthy combos if you allow your allies’ meters to build up far enough. Under optimal circumstances, Meruru can trigger a combo by using an item, trigger assist attacks from both her allies, then use a more powerful version of the same item, trigger a joint assist attack (often with an added status effect or stat reduction) from her allies, then finally make use of a “Potentialised” item to unleash its full capabilities for massive damage. Battles in the early game tend not to last long enough for this to be necessary, but the endgame bosses most certainly require you to master pulling off this technique as often as possible. And there’s an element of strategy and preparation required, too; each time Meruru uses an item in a combo, it depletes one of that item’s “uses” — thus, for the full combo, the item requires at least three uses available, otherwise you won’t be able to deal that devastating final blow. And, rather inconveniently, some of the most powerful attack items in the game (most notably Spirit Stones and Monster Pots, in my experience) only have two uses by default, meaning you’ll ideally want to craft them with traits that increase their available uses without lowering their effectiveness too much. This is a nice touch that encourages you to think a bit more about the alchemy sequences rather than simply aiming for the highest quality value possible. The items themselves work in a variety of interesting ways ranging from area-effect damage to elemental types, damage over time and additional debuffs, meaning it becomes increasingly important as the game progresses to choose appropriate consumables for the challenges you’re about to face. Even healing items fall into a wide range of different categories; some just heal HP, some can recover knocked out allies, some can restore MP and some provide buffs. Likewise, your allies’ skills also have plenty of different uses according to that character’s specialism. 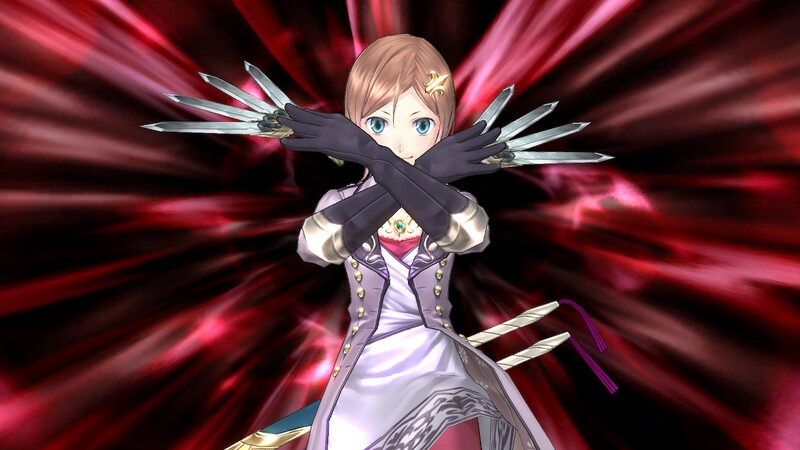 Some characters provide a well-balanced lineup of abilities, others clearly favour offensive or defensive stances, and both Totori and Rorona have the ability to use items, albeit without Meruru’s combo ability. Choosing a suitable combination of allies is thus important if you want to succeed in the more challenging battles of the game — though you can probably make some combinations work in one form or another with how “multi-purpose” Meruru herself is thanks to her items. A core theme in Atelier Meruru’s overall narrative is the idea of not getting too full of yourself and thinking that you are invincible, and this is emphasised throughout the combat sequences in the game — particularly later on. Even high-level characters can be relatively fragile, so it’s important to make good use of items and character abilities to set yourself up for success — and remember to bring along plenty of items to recover your resources, too, since this is easily forgotten. This theme is brought into particularly stark focus during the events that lead up to two of the possible endings — an extremely overconfident Meruru decides to take on a major enemy entirely by herself, and if you haven’t prepared yourself accordingly, you will find yourself absolutely flattened in very short order, promptly locking you out of those possible endings entirely unless you reload a previous save. This is a rare instance of your failure to achieve something in the game having a permanent negative consequence rather than simply costing you a bit of time, so it’s significant from a narrative perspective, whether or not you are able to survive the encounter. As in both Atelier Rorona and Atelier Totori before it, proper preparation for an expedition really pays off. Filling your basket with both healing and attack items, equipping your party with the best possible weapons and armour, producing quality accessories and even choosing a suitable combination of allies all play a part in determining whether or not you will be successful in a particular encounter, so take the time to put yourself in a good position before setting foot outside the gates of Arls. This is not a game you can just grind your way through by any means; patience is very much a virtue! And the need for patience goes for the various narrative events that unfold over the course of the game, too. Like Atelier Totori, there’s a really nice feeling of the world going about its business without you while you’re absent; returning to Arls after a long expedition will often see you with a variety of new events to enjoy with your various prospective party members, and as the overall story progresses, more and more characters (including a number of old friends from the previous two games) will show up in the kingdom to offer their services to Meruru. The majority of the events relate to the recruitable party members, with many of them contributing towards one of eleven different character-specific endings that you can pursue in addition to the “main” ending you’re after. Most character events are determined by your friendship level with the character in question; this can easily be increased as high as 60 simply by travelling with them in your party on the world map, but taking things any higher (as is required for a couple — though not all — of the characters) means you’ll need to do quests for them. Where things get a little interesting is in the fact that there are a huge number of events that take into account things like your overall progress through the game, the exact combination of people you have in your party and your location. Not all of these are essential to unlocking endings or event artwork, but it’s a real pleasure to see different characters interacting with one another as well as just Meruru; it makes you feel less like you’re triggering flags in a methodical manner (as will ultimately be necessary if you want certain specific endings on later playthroughs) and more like you’re really living the life of this brave young princess. One little but significant feature where Atelier Rorona Plus successfully improved on Atelier Meruru’s mechanics is related to these events: the simple addition of a marker on the quick travel menu that shows when an event is available. 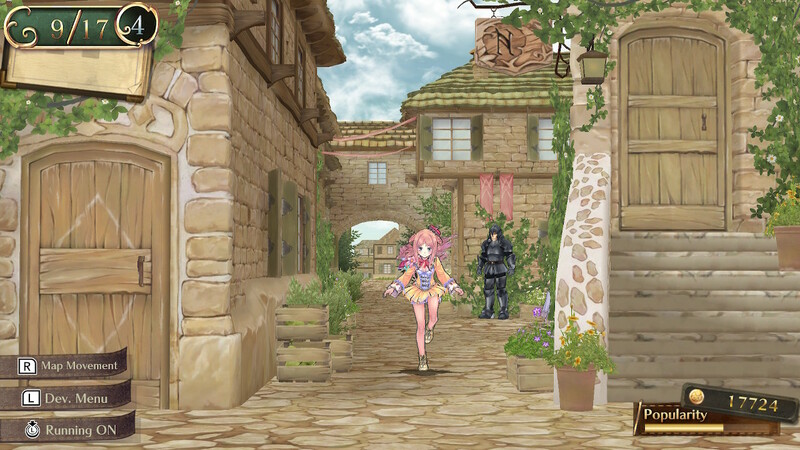 In Atelier Meruru, you can easily go a long period of time without realising there is an event you can trigger by, say, talking to a character who is normally a shopkeeper; in Atelier Rorona Plus, meanwhile, you can easily see when a new event is available and, if it involves a major character, who it relates to. 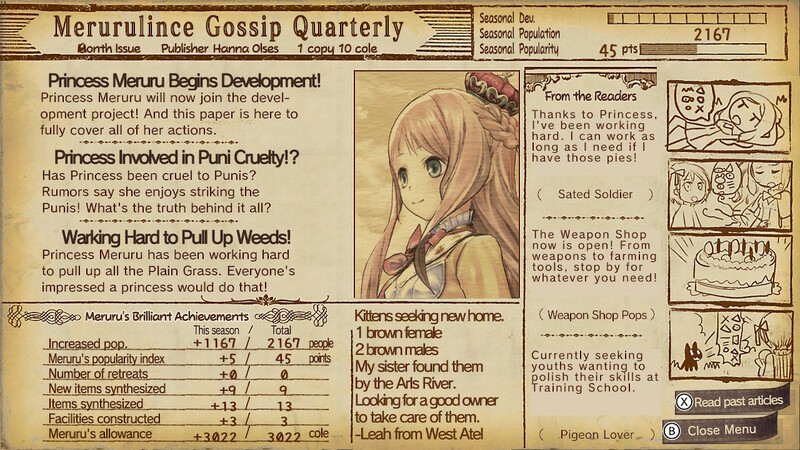 Ultimately this is a relatively minor issue, as the majority of Atelier Meruru’s important events are triggered automatically just by entering (or even passing through) the area in which they unfold, but there are just a couple of instances where you need to talk to the right person directly in order for something to happen; the addition of a marker in these cases would have helped out a great deal! Meruru is an appealing protagonist because she has plenty of personality about her, but is set up in such a way that the player is able to inhabit her role easily. At the outset of the game, she is shown to have a basic, working understanding of alchemy — a more than reasonable assumption for any player who has just come off the back of the previous two games — but who still has plenty to learn. In this way, she acknowledges those who are already experienced with Atelier games while keeping things accessible and understandable to those who, for whatever reason, are coming to this one first. The same is true for the returning characters from the previous games. While there are obviously pre-established relationships from the narrative context of the earlier titles, since Meruru is a new character, she is meeting these characters for the first time, allowing us the opportunity to remind ourselves of who they are and how they relate to the other cast members. 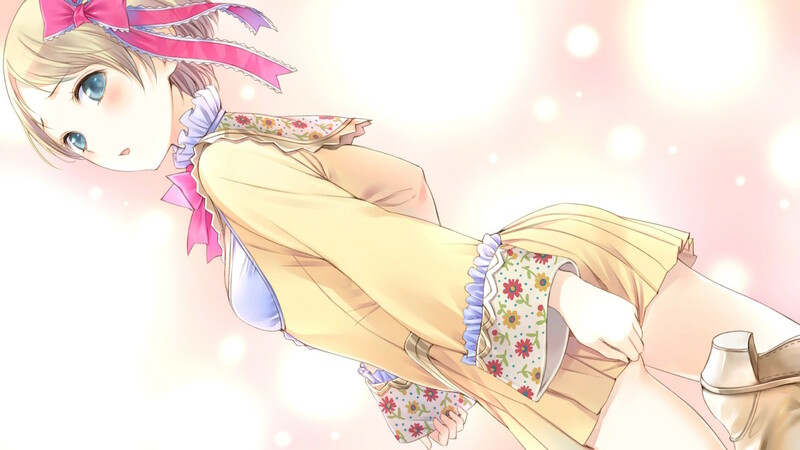 There’s also the fact that a number of years have elapsed since the last time we saw them; Atelier Rorona unfolded over the course of three years and Atelier Totori five, and there is implied to be a gap of at least a few years between each of the games rather than them immediately following on from one another. This means that even familiar characters have new information about themselves to impart, allowing even series veterans to feel like they’re having the opportunity to get to know something new to them. 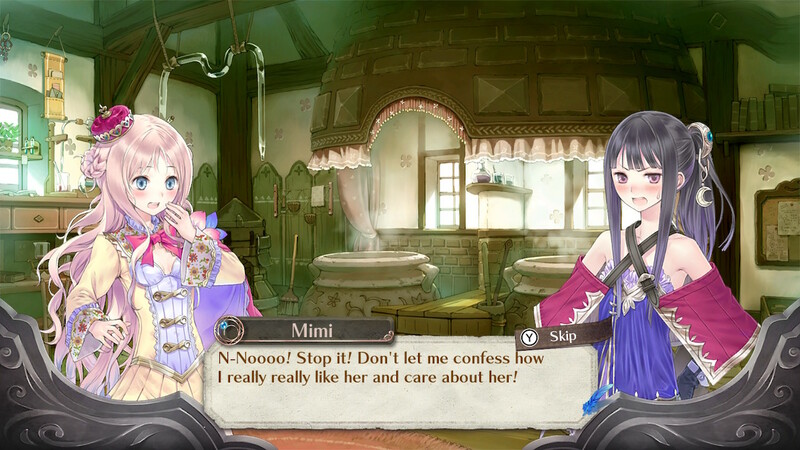 Totori is a particular highlight in this regard, having matured from the rather anxious young girl in her own game to an infectiously calm, gentle and mature young woman throughout Atelier Meruru. It’s clear she enjoys what she does throughout the game — particularly passing on her knowledge to the princess — but it’s also very apparent that her five-year adventure (and the emotional trauma that involved at various points) left her absolutely exhausted. Now all she wants to do is sit in her comfy chair, maybe do a bit of alchemy if she feels like it, and do her best to help out her new pupil. Rorona also returns, albeit in a child-like form after Astrid (who also shows up) has a bit of an accident with a potion of youth. 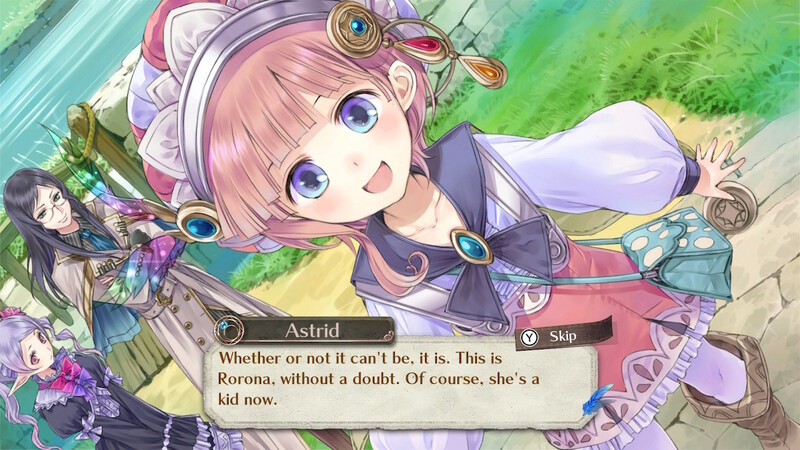 Child Rorona is a great deal of fun, and it allows the writers to explore her character in a whole new way; we saw throughout Atelier Totori that Rorona retains a significant amount of childishness and immaturity even after the successful completion of her own adventure, and in Atelier Meruru she is given the opportunity to embrace that fully. Interestingly, returning Rorona to normal is a completely optional process that can lead to three of the possible endings depending on various circumstances, but you have no obligation to pursue it if you’d rather focus on Meruru’s own wants and needs. Given the existence of Atelier Lulua, whose protagonist is supposedly (a very adult-looking) Rorona’s daughter, we can assume that at least one of these three endings is now considered to be canonical, however. 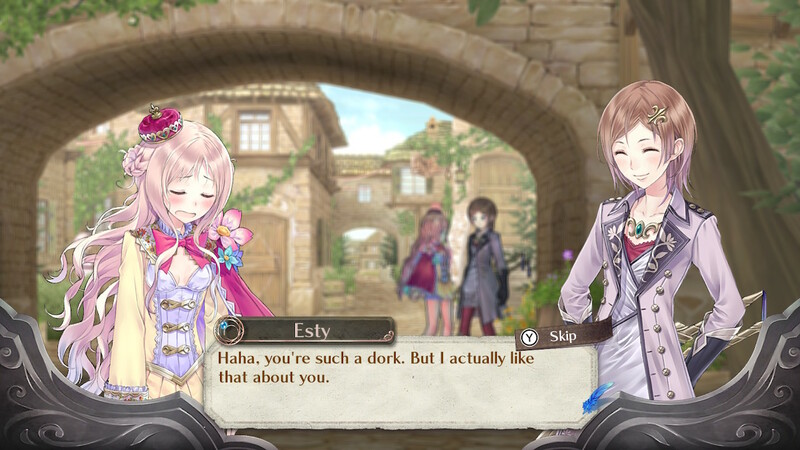 The older returning characters such as Esty and Sterk provide the opportunity for the game to provide commentary on different ways people might approach the ageing process. Esty is a case study in accepting your lot in life and throwing yourself into your real passions rather than getting too wrapped up in what society expects of you — for the most part, anyway — while Sterk, at the other end of the spectrum, demonstrates what can happen to someone if they remain a little too dedicated to what they believe to be their “duty”, even long after it has become irrelevant. 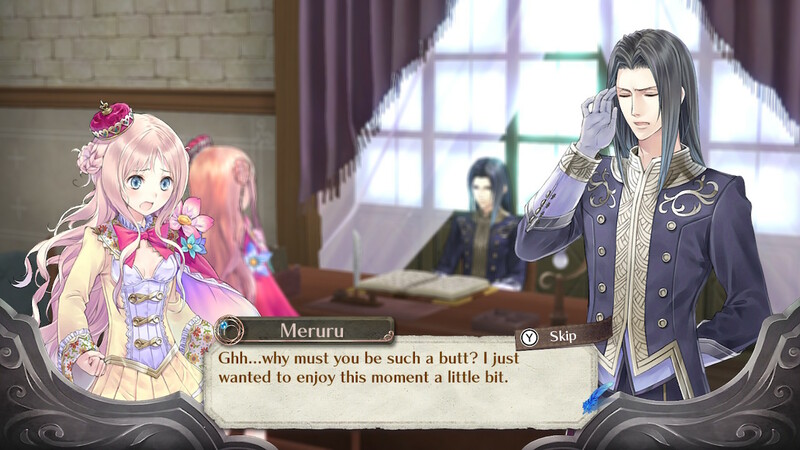 While Sterk is still a formidable combatant and a skilled warrior in Atelier Meruru, the progression of his depiction over the course of the three games is almost tragic; his oldest incarnation isn’t quite sure what to make of a world that has seemingly left him behind, and he doesn’t really know how to deal with that. I can relate! 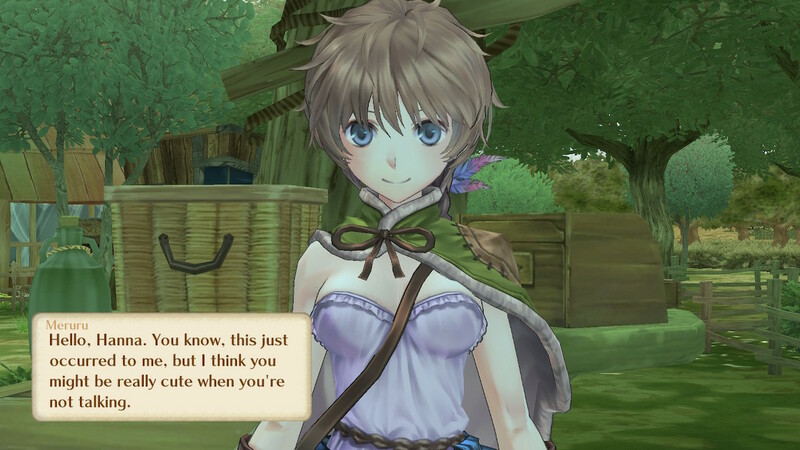 The new characters, meanwhile, kind of highlight how society has progressed since Atelier Rorona’s time. 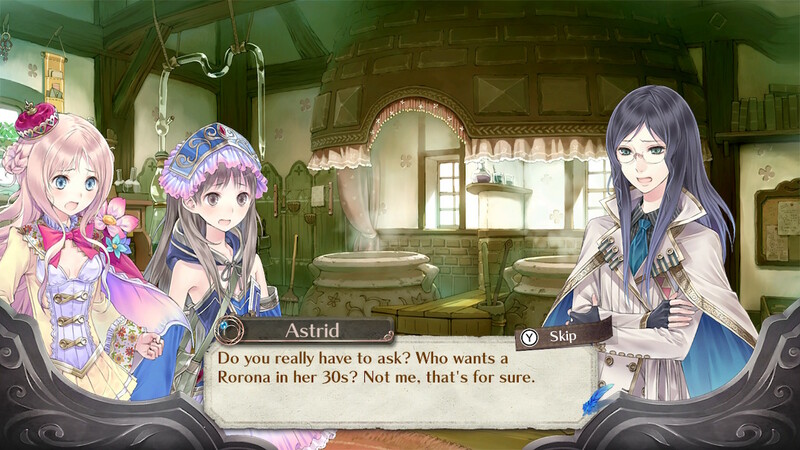 In Atelier Rorona, Rorona herself was a relative rarity in that she was a young working woman who was going out and getting things done; by contrast, many of the more incidental female characters in the game (playable characters such as Cordelia and Lionela aside, not to mention Astrid, who is a law unto herself) tended to have a fairly “passive” role in society. By the time of Atelier Totori, we saw characters like Melvia, who were putting men to shame with their physical prowess and bravery, contrasting strongly with Totori’s extremely domesticated (and very content) older sister Ceci. In Atelier Meruru, meanwhile,there’s a very strong sense of everyone being accepted for whatever position they want to fulfil in society — whether it’s stay-at-home housewife or go-getting adventurer. Meruru herself is a symbol of this acceptance: despite her father’s initial resistance to her desire to become an alchemist, it doesn’t take long for him to understand that she’s serious about what she’s doing. And Meruru, conversely, comes to understand the importance of her duties as a princess. This acceptance extends to matters of the heart, too. There’s a strongly implied romantic interest between Meruru and her longstanding maid (and childhood friend) Keina, for one thing, Esty’s sister Filly has clearly blossomed over time to fully embrace what appears to be bisexuality, judging by her exaggerated and somewhat excitable reactions to all sorts of stimuli in conversation, and there is absolutely no way that Mimi isn’t head-over-heels gay for Totori. Esty, in contrast to her sister, may be bitter and twisted at her perpetual singledom, particularly now she’s passed the big 4-0, but no-one actually judges her for it (despite her assumptions), and Meruru even respects her for it. 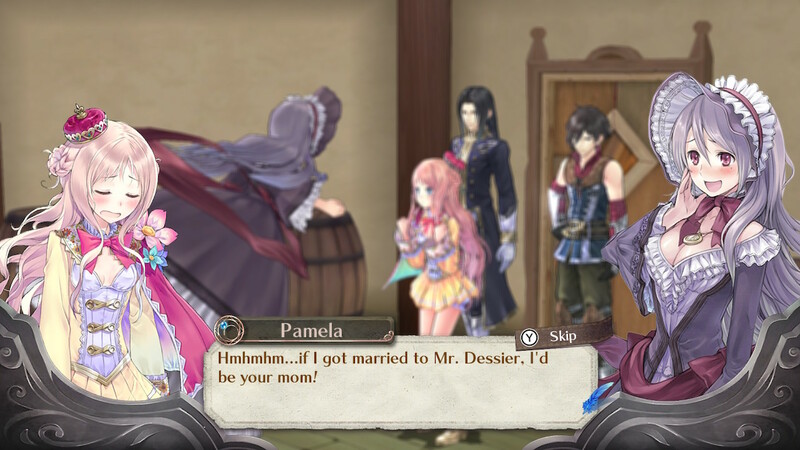 And when Pamela confesses that she has romantic feelings for several men around Arls, including butler Rufus, his brother Lias and even the apparently widowed King Dessier himself, no-one considers this in any way weird, despite her being, you know, dead. If you can accept — even embrace — a ghost in your midst, you can probably get along with most people. And that’s ultimately an important message we can take not just from Atelier Meruru, but from the Arland trilogy as a whole. 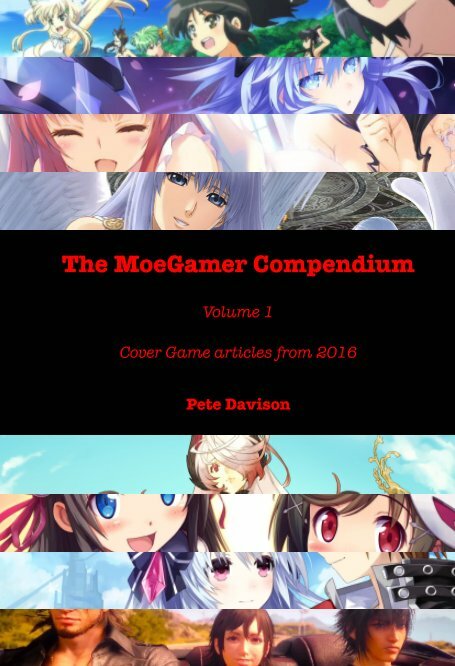 While all of these games feature quite significant battles against powerful demons, dragons and/or forces of nature at various points, the way they distinguish themselves from more conventional JRPGs is that these conflicts tend to be optional parts of the game, oddly unimportant in the grand scheme of things; instead, all the Atelier Arland protagonists really want more than anything throughout each of their respective stories is for everyone to get along with one another and have a nice life together. Koei Tecmo provided a review copy of this game. That’s why I always dress my part in bikinis. It’s to avoid crashes… honest! Good advice for life, right there!